It is hard to believe that we are already home from our two month trip to my husband's hometown. The summer is just flying by. It was with a great deal of anticipation and delight that I opened my e-mail each morning after I had sent my last newsletter. It was so much fun to tabulate your votes. The first question dealt with the difficulty level. It didn't come as a surprise to me that you voted for an intermediate level quilt. What was a surprise is the number of votes for an advanced quilt. I've given this a lot of thought over the last couple of weeks. 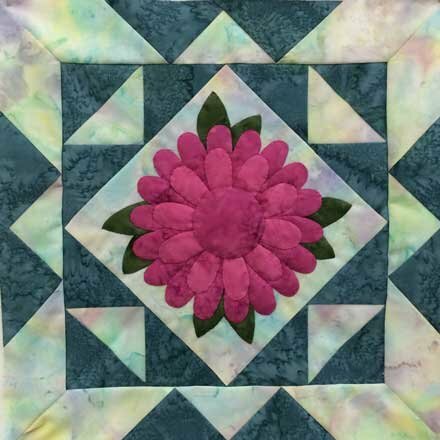 I love a challenge so have decided to try to do a quilt that can be upgraded from an easy quilt to an intermediate quilt. I will have suggestions for the advanced appliquists as to ways they can upgrade even more. For the second question you were asked if you want a playful quilt or an elegant quilt. The count was closer than on the first question - only 11 votes separated the two. An elegant quilt won. Next I began thinking about fabric. What fabric would make a quilt elegant. A trip to my almost local quilt shop - Mended Hearts Quilting in Ellsworth, Iowa was in order. Angela has lots of lovely fabrics but a gray Hoffman print called "Winter Magic" stole my heart. The red and brown cardinals sit on boughs of leaves and berries. The silver and gold threads were elegant. I often pick a theme fabric to use for my color scheme. I won't promise to use this fabric in the quilt but at the moment I think it will be the borders. You can see the additional fabrics I chose to go with it below. All of them have silver or gold threads. I have also purchased a 5" charm pack and a 10" layer cake. The 5" charm is Forest Frost by Sentimental Studios for Moda. The layer cake was Winter's Grandeur by Robert Kaufman. 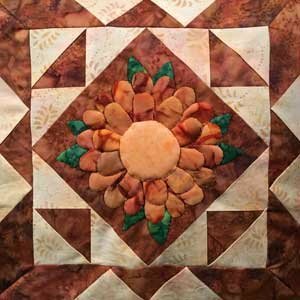 The charm pack and layer cake give me a large variety of fabrics I can use for applique without having to buy a fat quarter or a quarter yard of fabric of each. These fabrics may be joined by others as I go along. I hope to include some beading and some 3-D elements as well. These will be optional. Dorothy Cobie of Story City, Iowa took my Beginner's Quick Prep Applique class as Angela's "Mended Hearts Quilt Shop" in the fall of 2015. 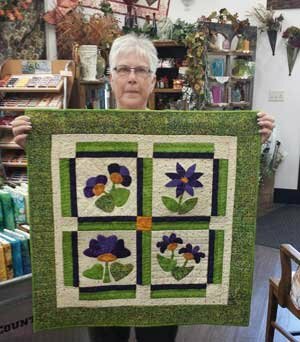 She recently brought the quilt into the shop for Angela and her staff to see. We had a four week class. Each week I taught one of the 4 elements of hand applique. The first week we learned to do outer curves. The block in the upper left is made up entirely of outer curves. The second week we did inner curves. The block in the lower right uses both inner and outer curves. The third week we tackled outer points (see block in upper right hand corner) and the fourth week added inner points (lower left). Dorothy, your work is beautiful. Hard to believe that you were a beginner. I love your colors. Can there be anything better than purple and green? I don't think so. I have had several requests this month for previous patterns in our current BOM. Here are all that have been published so far. Download January's "My Favorite Rose". Download February's "Rose". Download March's "Cosmos". 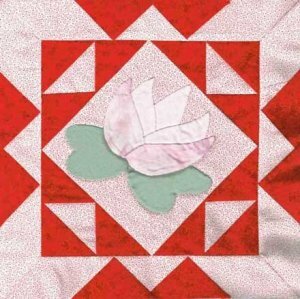 Download April's "A Simple Rose". 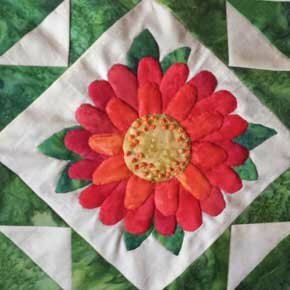 Coralie Williams of Yeppon, Queensland, Australia has sent a photo of her "Water Lily" block from Karen's Gingerbread Florals. It is so soft and lovely. Karen's Gingerbread Florals - a free BOM - "Zinnia"
Do you have zinnias in bloom? I don't even have any planted. I miss them. I think it must have been one of my mother's favorite flowers. As a girl I remember the zinnias in her garden. The colors were so rich - from bright yellow to rich rusts, from bright pinks to deep purples. You can use almost any color to make your zinnia pop. Yes, there are a lot of petals but it is surprising how fast they go. This month these gals have given us two very different interpretations of the zinnia pattern. Karen's to the left was done in batiks that have a lot of shading to differentiate the individual petals. My block above was also done in batiks but the fabric I chose didn't have as much variation in color. Georgie's to the right uses multiple fabrics each with less variation in shading. Each of the blocks is unique and gorgeous. What will your block be?